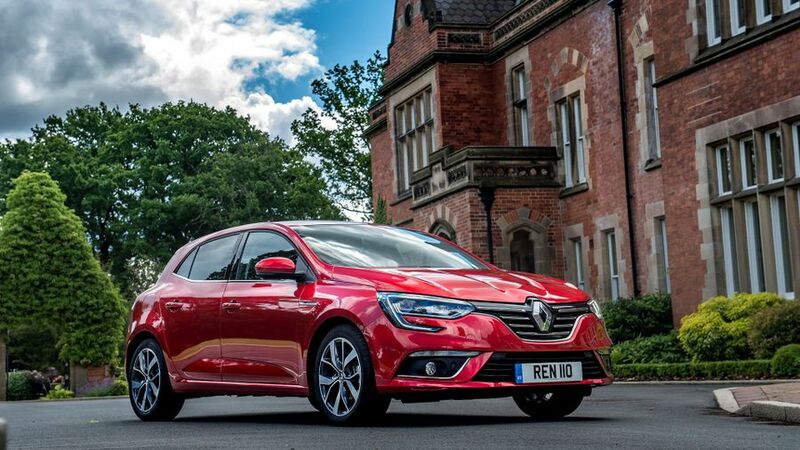 The latest Renault Megane doesn’t trouble the very best cars in the family hatchback class, because it falls a little short on quality, practicality and driving manners. That said, it’s still a reasonably compelling proposition. It looks great, it’s affordable to buy and run, and it comes packed with kit. For many buyers, that’ll be enough. 1.6 TCe 205 EDC GT Nav. 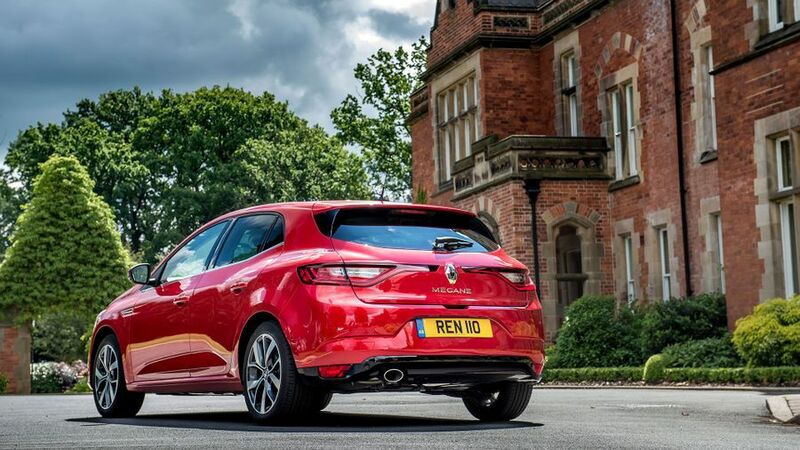 In recent years, Renault has done a cracking line in flamboyant styling, and the new Megane is certainly no exception. Stood next to the conservative and rather humdrum aesthetic offerings that fill the family hatchback class, the Megane really catches the eye. You might recognise the C-shaped headlamp design (complete with LED daytime running lights on every model) from other recent Renault models. There’s plenty more of interest besides, with all sorts of curves and creases, leading to the elongated tail lights that stretch almost right across the rear end. All versions of the car have alloy wheels and colour-coding for the bumpers and door mirrors, but aside from different sizes and designs for the wheels, every edition looks pretty much identical until you get near the top of the range. Signature cars are marked out by their full LED headlamps, and GT Line and GT models also get a sporty body kit. 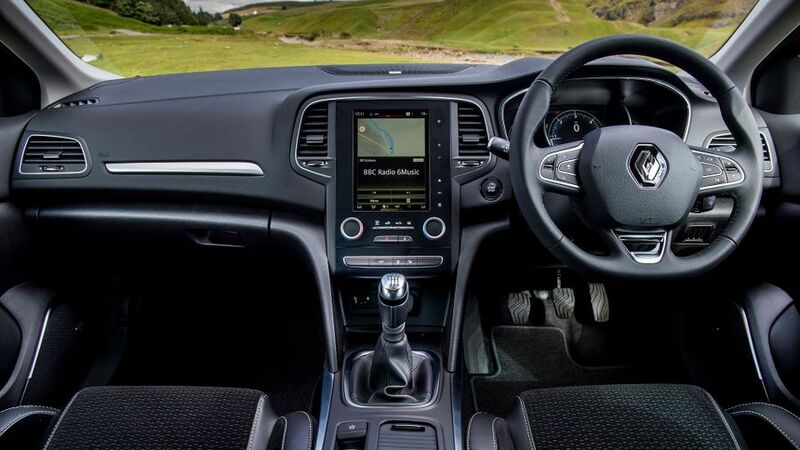 Only the most basic model misses out on a touch-screen infotainment system. Lower-end versions get the same 7.0-inch screen found in other small Renaults, which can be a little cluttered and confusing to use. In higher-spec Meganes, that’s replaced by an 8.7-inch portrait screen, which immediately gives the cabin a more high-tech feel. The bigger screen makes the infotainment easier to navigate, too, although it’s still not the most intuitive system of its type. Elsewhere in the cabin, it’s a little hit-and-miss. There are some genuinely impressive materials on display in some places, but in quite a few others, you find harder, shinier plastics that damage the overall feeling of quality. The sculpted seats are wonderfully supportive and have bags of adjustment, but the small rear window and thick pillars mean your rear visibility is rather limited. 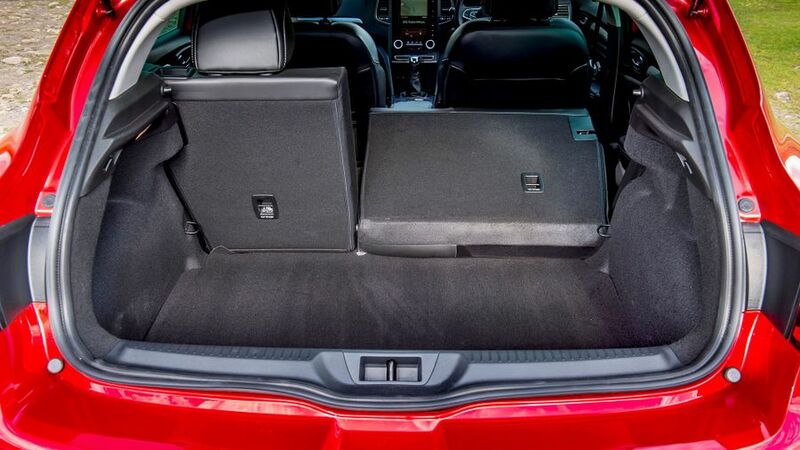 While those in the front seats have bags of space, the rear chairs are tight for both headroom and legroom; anyone over six feet tall will struggle on both counts. 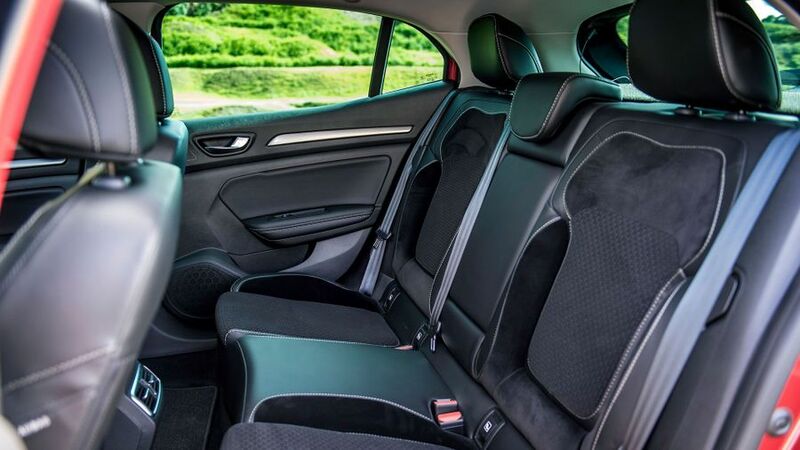 The middle seat is wider that you find in many cars of this type, and it’s not raised too high, either, but the limited foot space throughout the rear footwell still means that carrying three in the back is not a comfortable experience. Things aren’t that great where luggage is concerned, either. While the boot is a decent size at 384 litres, there’s an enormous lip that you’ll need to muscle heavy items over, and the back seats don’t go anywhere near flat when you fold them down, leaving vast step and a small slope. The Megane is neither the most comfortable nor the sharpest car of its type. The suspension clunks and thumps over bigger bumps, and you can feel the body floating and lolloping in bends, and over undulating surfaces. That said, the suspension is supple enough that you won’t be wincing over most surfaces, so you’ll be comfortable most of the time. There’s no shortage of grip, either, but unfortunately, the steering doesn’t really do the handling any favours. It feels incredibly remote, and when you leave the drive mode selector (provided on all but the entry-level version, altering the behaviour of the steering, throttle and engine sound) in Comfort, the featherlight weighting can have you wandering around in your lane. Selecting Sport mode dumps in more artificial-feeling weight, and although this doesn’t make the steering any more engaging, at least the extra resistance makes the car feel slightly more stable. The GT version has a sportier suspension setup to crank up the thrills, but it falls wide of the mark. The ride becomes rather firm, damaging the standard car’s comfort levels, and it doesn’t feel any more involving to drive. It feels like the tyres are skipping over the road surface rather than biting into it, and the steering is still remote, despite being quicker. Granted, the four-wheel steering system you get on this version does make the car more manoeuvrable at low speed, but it doesn’t deliver the thrills when you’re going faster. The Megane is offered with a pair of petrol engines and a pair of diesel engines, all turbocharged and most of which can be specified with a twin-clutch gearbox. So far, we’ve only tried two of them, our favourite being the 108bhp 1.5-litre diesel. Granted, it’s no ball of fire in the pace department, even when you rev it out, but its generous low-down torque makes it really flexible and easy to drive. The fact that it’s also impressively smooth and quiet really helps its easy-going nature, so it’s best to just sit back and adopt a lazy, short-shifting driving style. It’s just a shame that the notchy, long-throw gearchange isn’t a little more satisfying. The other diesel is a 128bhp 1.6, while the entry-level petrol is a 1.2 with the same output. The other engine we’ve tried is the sportiest of the bunch, the 202bhp 1.6-litre petrol in the GT model. Granted, it manages to deliver warm-hatch pace, but wherever you are in the rev range, it never feels anywhere near as powerful as the output suggests, and there’s something detached and undramatic about the way the car gathers speed. The twin-clutch gearbox, standard on this version, also hampers your progress because it’s a little slow to switch cogs and it often finds itself in the wrong ratio for the job at hand. 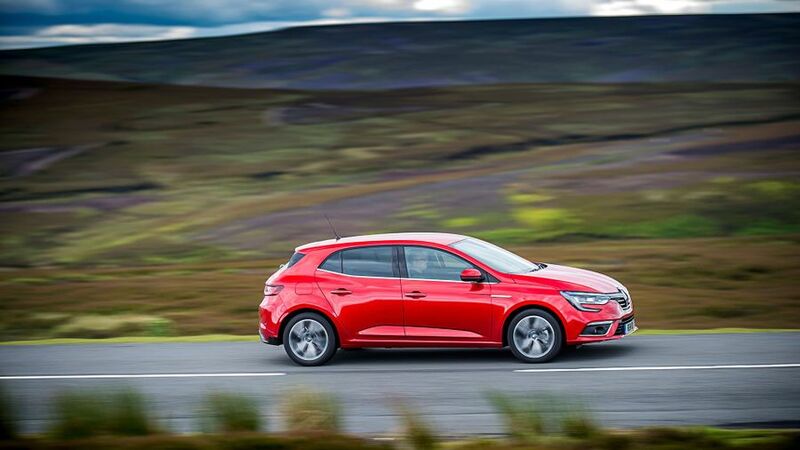 Compare the Megane with rivals like the Ford Focus and Volkswagen Golf, and the Renault is a useful bit cheaper. Prices are more on a par with those of the Seat Leon and Hyundai i30, but they’re still very competitive. It’s tough to know how well the car will hold on to its value over your period of ownership, but it’s fair to say that previous Meganes haven’t exactly dazzled in this area. Most versions appear to be competitive with rivals on fuel consumption and CO2 emissions, with the star of the show being the 1.5-litre diesel, with official figures of 76.4mpg and 96g/km. All but one of the diesels do better than 70mpg, and all but the most powerful petrol gives you upwards of 50mpg. Take a look at the Warranty Direct Reliability Index, and you’ll be pretty happy with the prospect of how reliable your Megane should be. Renault sits firmly in the top half of the manufacturer rankings, and as an individual model, the Megane hasn’t done at all badly, either. Granted, that historic performance could count for nothing with the latest car being based on a different platform, but we’ve heard very few complaints from owners of cars that share that platform – including the Nissan Qashqai and Renault Kadjar – over reliability. Renault offers a middle-of-the-road three-year/60,000-mile warranty. 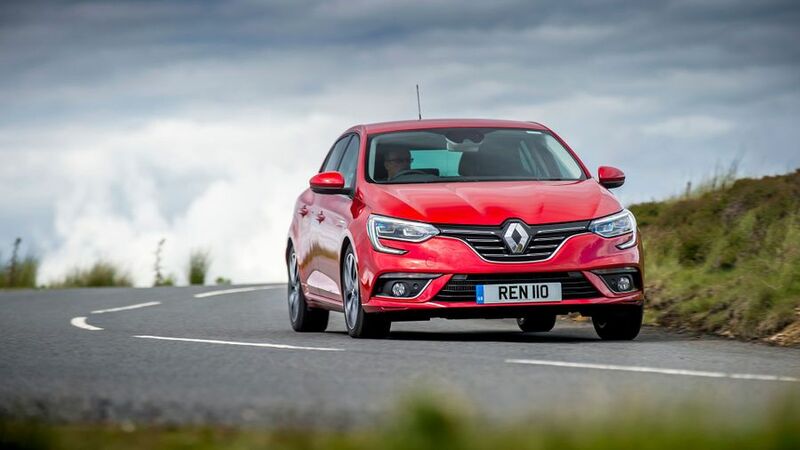 Being a Renault, you’d expect the Megane to be one of the safest cars in its class; and, indeed, the car has earned the maximum five-star rating from Euro NCAP. All versions come with six airbags and tyre pressure monitoring, while all but the entry-level version also have lane departure warning and automatic high/low beam lights. It’s strange, then, that autonomous emergency braking - standard-fit on many rivals - is left on the options list for all versions. Anyone who chooses a Megane will enjoy a generous amount of standard equipment. The entry-level Expression+ model comes with alloy wheels, cruise control, air-con, four electric windows and a DAB stereo with Bluetooth, while the upgrade to Dynamique Nav trim earns you nav (obviously! ), climate control, automatic lights and wipers, keyless entry, rear parking sensors and part-leatherette upholstery. Dynamique S Nav gets you the portrait screen, front parking sensors and a reversing camera, while Signature Nav has full leather trim and LED headlamps. GT Line Nav gets a sporty body kit, while the GT Nav has a powerful engine, four-wheel steering and a twin-clutch gearbox. We won’t pretend that the Megane is the best car in the family hatchback class, as it has flaws in a lot of areas. But, if the class leaders are too common or too conservative for your tastes, then we could understand you choosing the chic-looking Renault. And, as well as looking good, it’s also packed with equipment and is affordable to buy and run.